A 65 year old woman presents with a palpable right breast mass. Core biopsies show a proliferation of bland spindle cells arranged as intersecting fascicles. 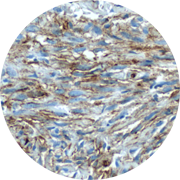 The cells are admixed with hyalinized collagen fibers. Scattered mast cells are also seen. Necrosis is not present and mitotic figures are not conspicuous. Immunoperoxidase stains show that the lesional cells are positive for CD34 and desmin. No staining is seen with p63, Cam5.2, CK5, CK34betaE12, panCK, actin, or S100 protein. The histomorphologic features coupled with the immunoperoxidase staining pattern support a diagnosis of myofibroblastoma. Excision is recommended, however, to permit a thorough evaluation of the entire lesion.